Flying a mission that matters? Your bird needs CLAW’s. 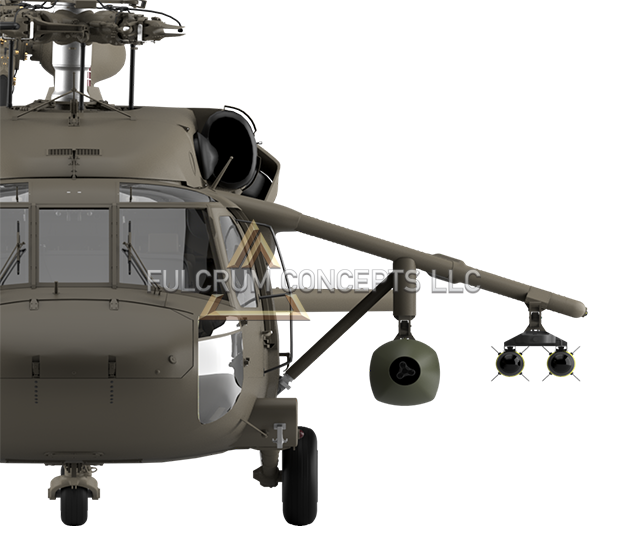 Rapidly re-configure your Black Hawk with a 2-to-4 station weapons wing. This classic airframe design is easily repairable and is and hundreds of pounds lighter than other systems. Supports a variety of munitions, including the M230, GAU-19, Hellfire, M261, GP-19, and DAP-6. 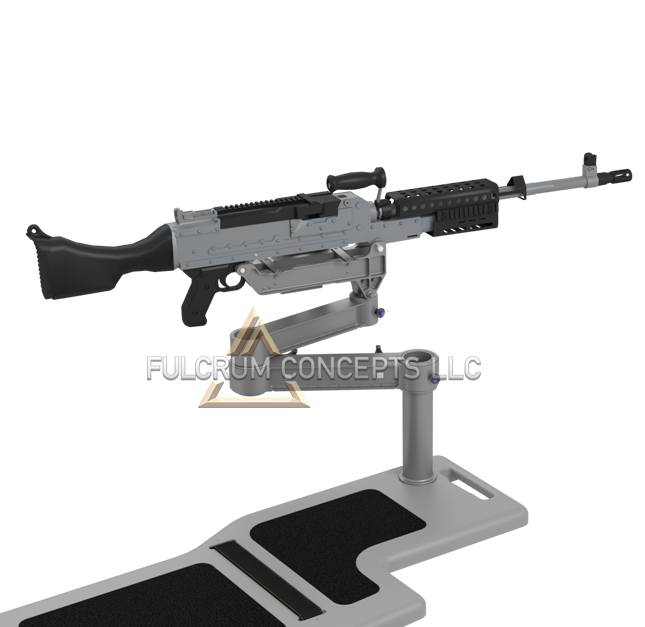 Fulcrum Concepts is pleased to announce the availability of the next evolution of the LASS / MSLASS / EFS wing cart. 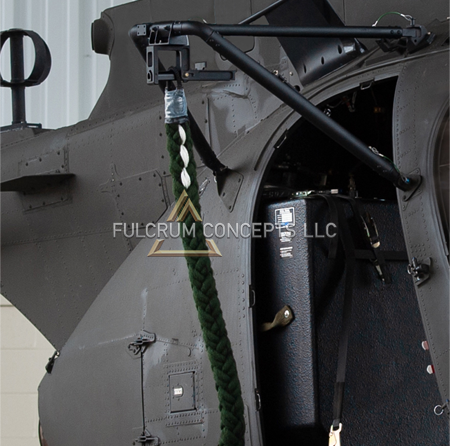 The FC wing stand provides a stable and maneuverable platform for all currently available UH/MH-60 wings and is ideal for both storage and maintenance of the wings. 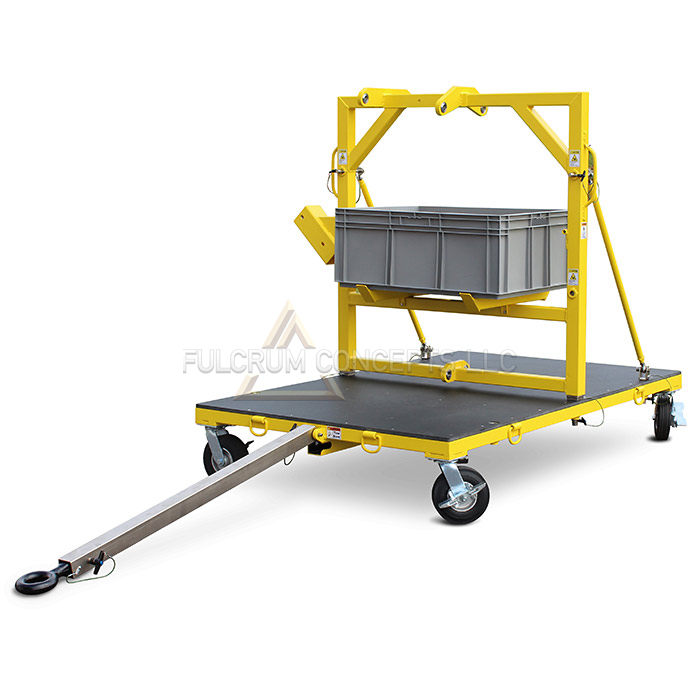 The cart can be easily configured for left or right, single or multi-station stores and features a low CG and heavy base design combined with large caster wheels to increase mobility while reducing the possibility of tip over while transporting. 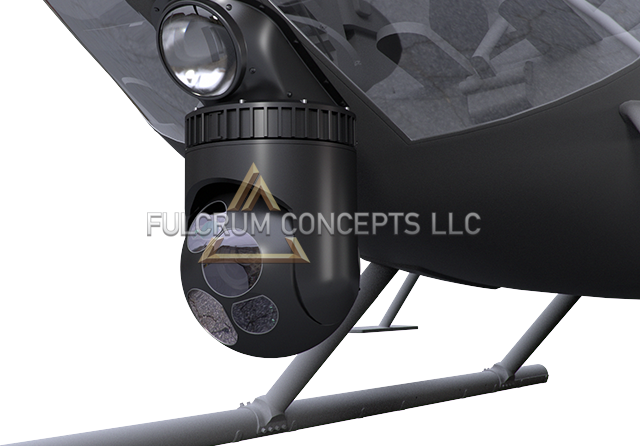 Additional features include storage bins to hold miscellaneous items such as fairings and expandable pins, removable tow bar for tug use and the ability to mount external stores on the wings to allow the cart to function as mobile trainer. The attachment locations are identical to the aircraft interface as well as an interface panel for bulkhead connectors, offering the additional capability of electrical interconnection and diagnostics. 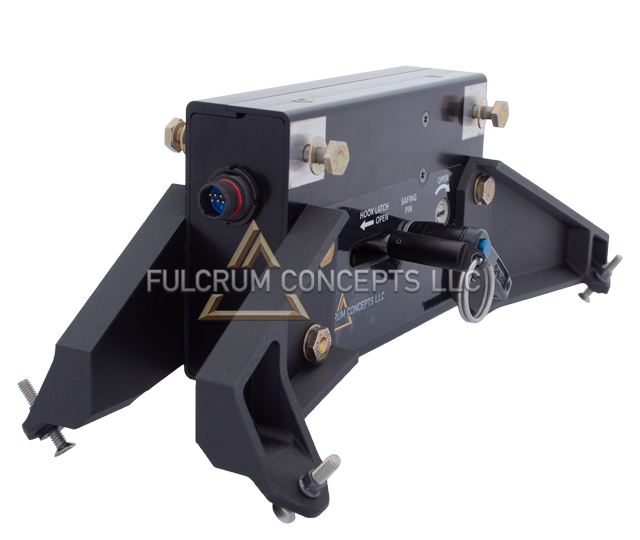 The Fulcrum Concepts Lift Kart greatly reduces installation and removal effort onto a variety of platforms. Additionally, the Kart increases the level of safety for both personnel and equipment when the sensors are being installed, removed, transported, or stored. 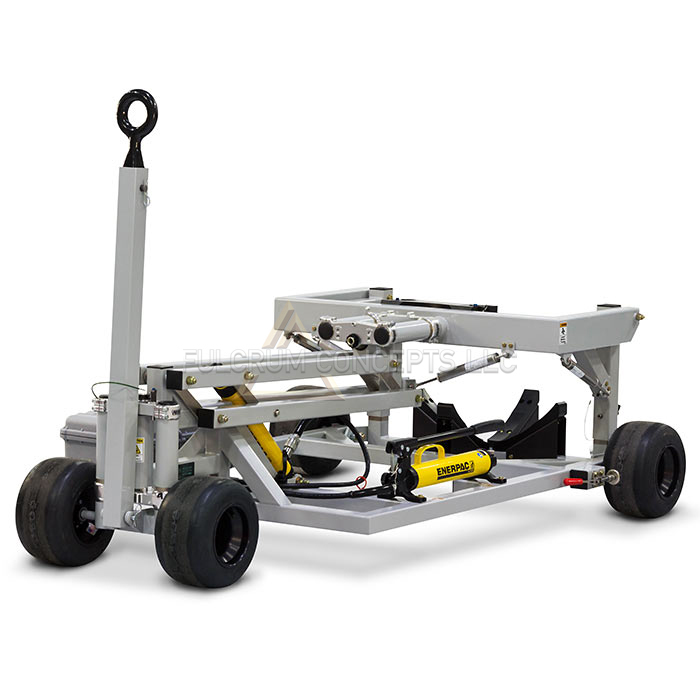 The Kart features a hydraulically powered lifting arm, wide wheel base, and self-leveling platform. Compatible with Wescam’s MX-15, MX-20, and MX-25 sensors. Ropin’ ain’t just for cowboys! H-6i/H-6M series and 530 series variants fast rope insertion/extraction system. Features a lightweight, rugged design with a proven release mechanism. Improve system performance, lethality, and endurance without sacrificing anything. More targets, more range, more endurance. The ultralight Mini-BRU weighs less than 2 lbs and safely secures weapons systems up to 50 lbs. Integrated neatly into the Hellfire rail system, the Mini-BRU more than doubles the munition capacity of your bird with no invasive modifications. Fly lighter, operate longer! Lightweight, crew-served weapons mount and pintle arm for the DA MCAS. Compatible with the M240, M249, and .338 MMG. The Gun Control Battery Unit (GCBU) is a selfcontained energy source and gun control system. 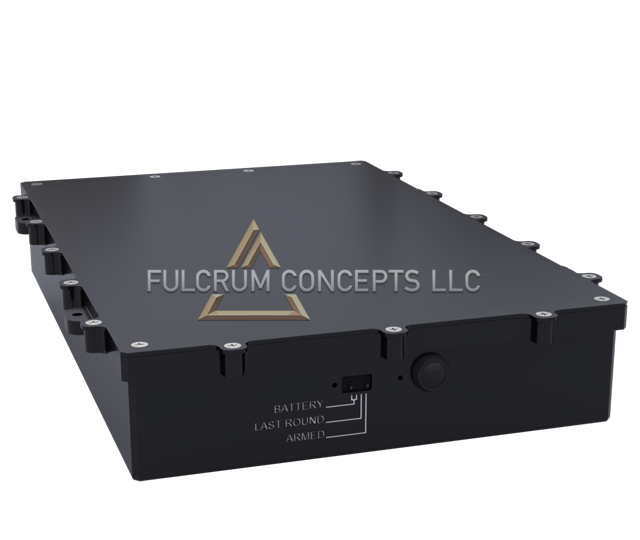 It has been designed to be a completely federated system that can power and operate a wide variety of 24-28Vdc gun systems. The GCBU is energized by either applying a charge input or routing the standby output from the GCBU through a switch in the host back to the GCBU standby input. After energizing the GCBU only an ARM and Trigger input are required to operate the gun system. The GLB-4 is a lightweight airborne launcher designed to be carried on both fixed wing and rotary wing aircraft. Move up in the world! The MD530 Series EO/IR Sensor Mount provides a 6.5in ground clearance improvement over existing designs. It is lightweight and easy to install. Uncomplicate your tool box. 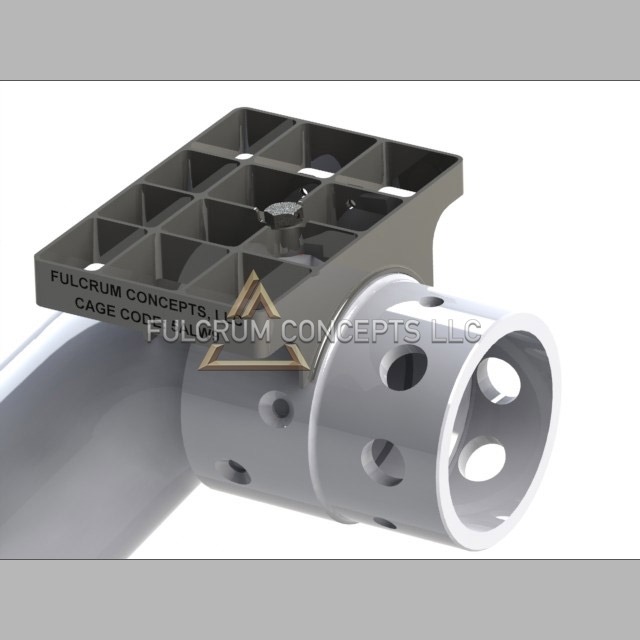 Fulcrum’s ALKAN BRU Multi Tool does the work of three; its 8mm hex end acts as the Hook Lifting Control Key, its 6mm hex end interfaces with the ALKAN ¼ Manual Lock Release, and it also has an integrated safing pin. 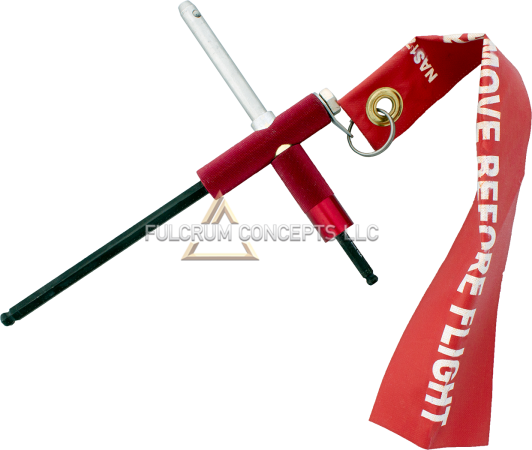 Plus, it comes with a Remove Before Flight ribbon to reduce the likelihood of costly accidents. 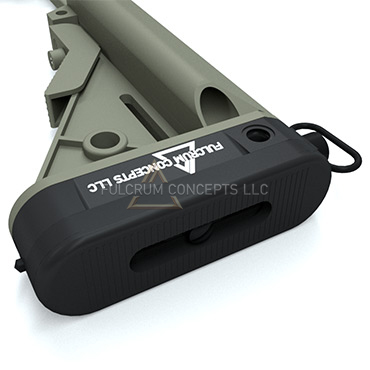 Install your munitions faster with Fulcrum’s new multi tool. This Rocket Tool Kit is designed to be a compact, convenient, and durable way to store and transport your essential rocket related components. 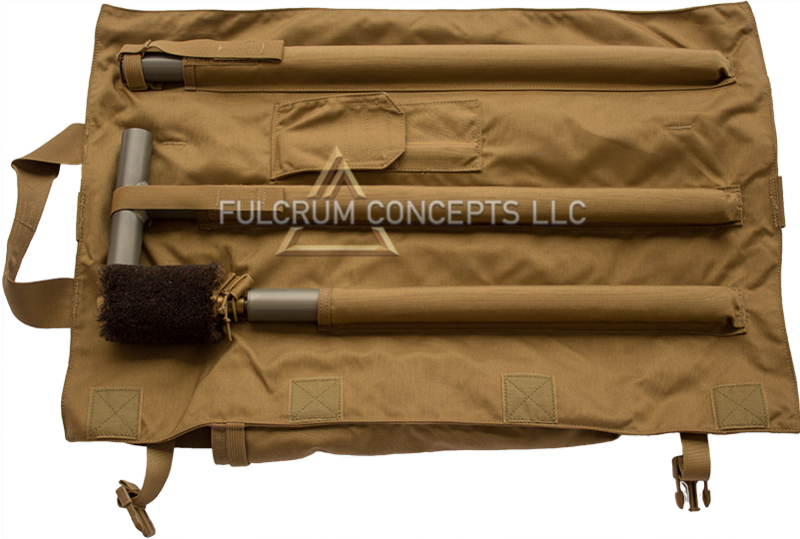 It comes with a collapsible bore brush and an ergonomic Munition Assist Tool, plus room for additional tools. The heavy-duty nylon bag protects your assets while making them easier to stow. Improved ergonomic design offers increased functionality over outdated versions. Tapered body design reduces the chance of the tool “hanging up” on the sharp edges of the rocket pod. 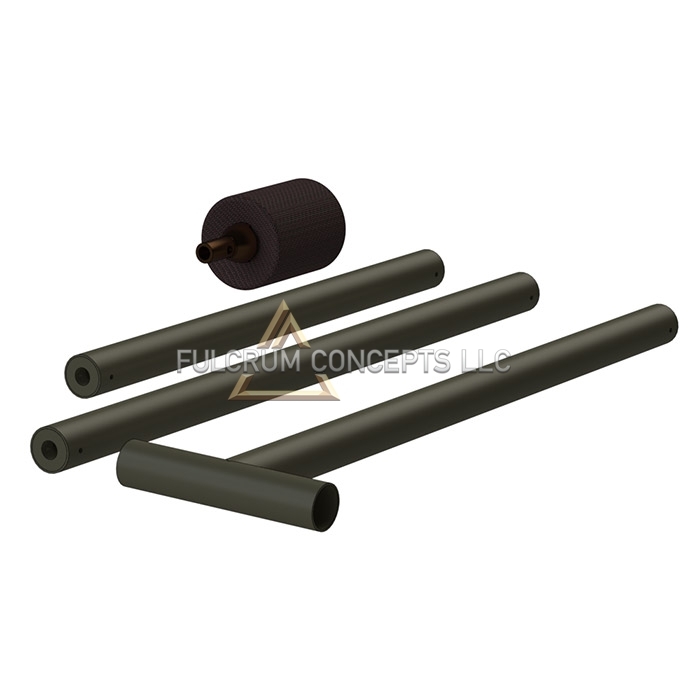 Rubber coated ends and nonconductive material exceeds all MIL-STD non-conductive and anti-static requirements and reduces potential damage to the rocket and equipment. Increased width of igniter arm slot allows easier use, especially in low visibility conditions. 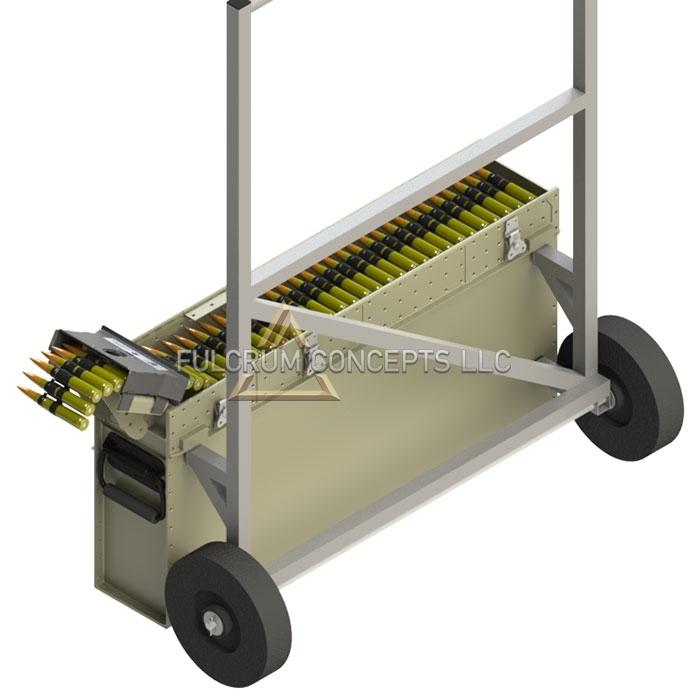 Design allows for a full 500 rounds of .50 caliber ammunition to be linked, staged, transportable and ready to load on the FARP pad for .50 Cal weapon equipped aircraft. Transport dolly allows for a full .50 caliber reload to easily be re-positioned to the aircraft by one person, drastically reducing rearm time. Additionally, the device is equipped with an ammunition rounds gauge positioned so the rearming personnel gauge the rounds as they are being loaded into the aircraft ammunition container, significantly reducing the possibility of weapons malfunctioning due to incorrectly linked ammunition. This lightweight universal cargo pod features a 8.85 ft3 storage volume, 24 inch doors, and a maximum load capacity of 350 lb. 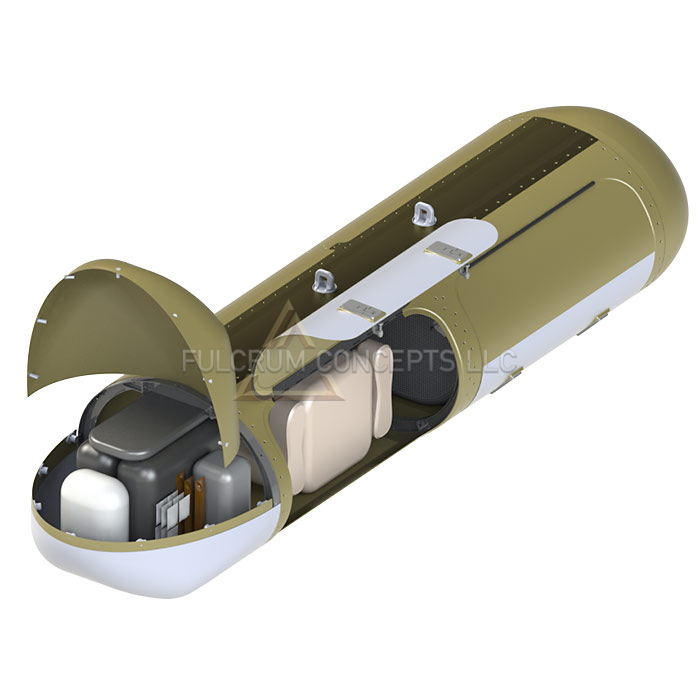 Made with a rugged, durable construction and Mil-Std 14 inch bomb lugs, the pod can be installed on a variety of platforms and is left/right reversible. The pod maintains internal tie downs, a flat floor deck, and flush mounted latches. 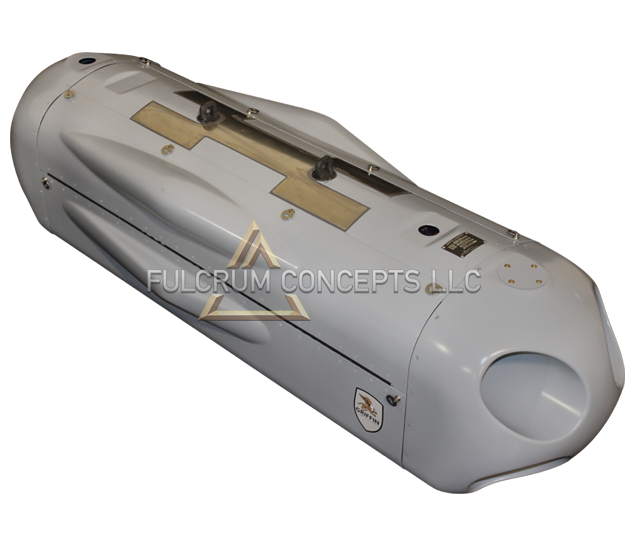 At nearly 7 ft long, the pod is ideally suited for a broad array of equipment and sensor installations. The Universal Weapons Pylon (UWP) Step weighs .25 lbs. and provides pilots and maintainers a stable, non-slip stepping surface while performing maintenance and pre-flights. Additionally, the step reduces the possibility of pilots or maintainers stepping on and damaging critical components and cables attached to the UWP. 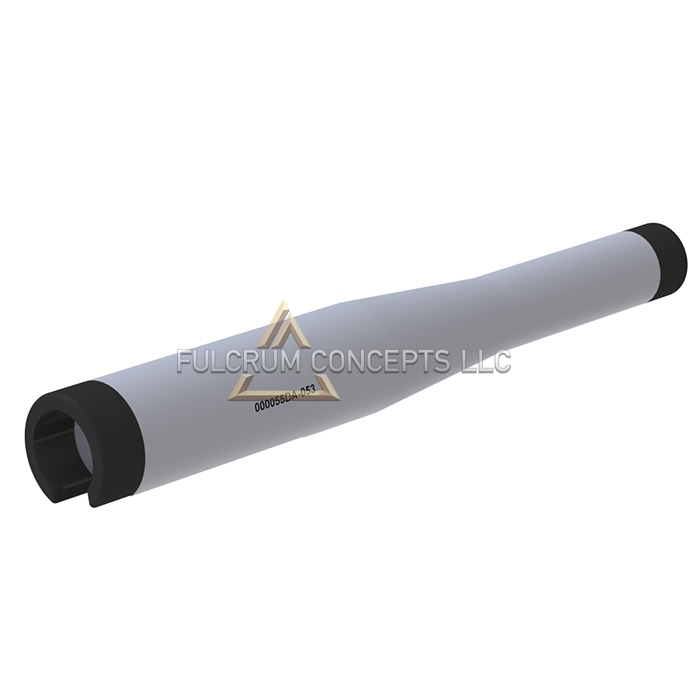 The qualities that made Fulcrum personnel highly effective war-fighters and corporate leaders prior to joining the Fulcrum team are fundamental to success in any endeavor- leadership, problem solving, and establishing a shared vision.